FIU researchers dive into the world of sharks and volcanoes this week during Discovery Channel’s Shark Week. Mike Heithaus, marine scientist and dean of the College of Arts, Sciences & Education stars in Devil Sharks, which airs at 10 p.m., Wednesday, July 26, on Discovery. He is joined by FIU post-doctoral researcher Jeremy Kiszka, research analyst Kirk Gastrich and Ph.D. candidate Frances Farabaugh. Across the world, sharks congregate around volcanoes and volcanic islands. From active, dormant to extinct, volcanoes hold a strong attraction for sharks of all kinds, but little is known about this phenomenon. The FIU team goes in search of answers to uncover why volcanoes become shark hotspots? Heithaus has spent his entire career studying marine predators, specializing in the ecological importance of sharks and other large marine species including whales, dolphins and sea turtles. His research includes investigating the ecological consequences of overfishing large predators, predator-prey interactions, and the ecology of seagrass ecosystems, coral reefs, and deep-sea communities of the Gulf of Mexico. He has published more than 110 scientific papers and co-edited three books on sharks. 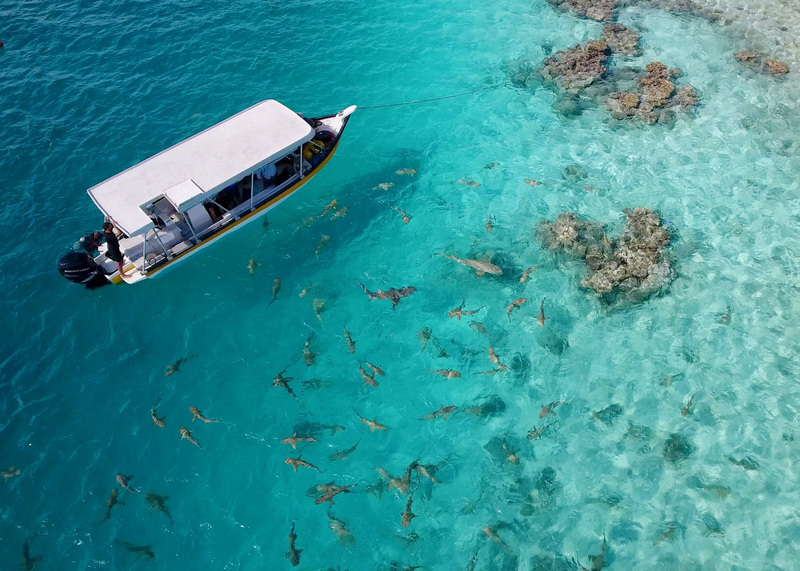 Along with FIU marine sciences professor Demian Chapman, Heithaus is one of the researchers behind Global FinPrint, an international project surveying the world’s reef shark and ray populations. The project has received core funding from Microsoft Co-Founder Paul G. Allen. Marine scientist Yannis Papastamtiou will also make an appearance in this year’s Shark Week alongside Chris Lowe from California State University in Sharks and the City: LA. The show, which airs at 9 p.m. Tuesday, July 25, investigates the recent increase of great white sharks along California’s coast and their out of season hunting behaviors. Papastamatiou deploys camera tags on great whites and goes diving to retrieve underwater listening stations to find out why sharks aggregate around a small island in the Pacific. In addition, Global FinPrint researcher Mark Meekan from the Australian Institute of Marine Science will also appear on Shark Week in Shark-Croc Showdown, airing at 9:10 p.m., Sunday, July 23. Following Meekan as he conducts fieldwork for Global FinPrint, the show explores what happens when crocodiles invade the shark-infested waters around the remote wilderness of Australia’s Northern Territory. Definitely, Shark Week is one of the most anticipated programs and it’s always interesting to learn new facts about this unique species. And even this time also it has been interesting as always with so many different perspectives. Loved Shark Week. Learned alot about these amazing animals!! !